While working on drawings for pi is by Design, I noticed a propeller shape which led to 3-d drawings followed by the construction of a physical model for further analysis. 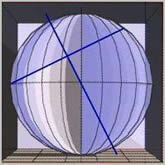 After examining the numbers and mathematical patterns involved in this model I saw the potential for new discoveries. Realizing that these findings could be of interest to engineering students and others I decided to put my findings into the public domain. The small blue diamond sitting on top of the red line contains the location of π 3.14159..., plus the slightly larger related number 3.1416026... The proof that these are near perfect ratios/proportions is in the circle diameters. Any change in the two diameters and the ratio 1.8 (64.28571428.../35.714285714...%), will cause the number 3.1416026... to change. Perfect is pi 3.1415926..., but impossible to achieve in the physical world. • All horizontal and vertical measurements end with the repeating remainder " 142857 "
• The number seven recurs frequently. For example the height of the 100mm propeller (or %), divided by one-half the thickness of the central disk (14.285714...mm) is 7. • The disk diameter 53.428... divided by 17 is 3.142857..., and 17 is number 7 in the list of primes. • The blade thickness on the centerline is 7 and there are 7 blade segments. The circle diameters increase/decrease by 3.5 times. There is a Sun and Planets link. The square of the hypotenuse of a right triangle is equal to the sum of the squares on the other two sides. These next images illustrate how I envisioned the propeller, and how it might function. I believe that this model holds valuable information, such as optimum air or water flow possibilities for aircraft, ships, etc. The central disk now correctly depicted as football shaped in these next images. This idea originated from the magic square of the sun drawing wherein I also discovered the Great Pyramid pattern. As mentioned in that webpage the magic squares are reputed to be thousands of years old. Perfect ratios and patterns are a universal phenomenon, and the torpedo shaped Bluefin Tuna is one such example.